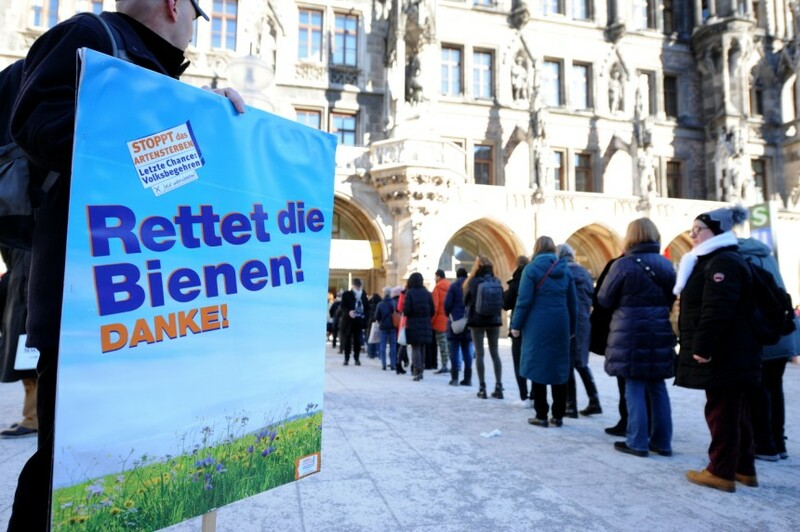 This two-week on-site signature collection time window is the only way to initiate a referendum under Bavarian law. This referendum is an actual bill that will become state law, not just a petition or list of demands, and once enacted, can only be amended by another referendum and not by the legislature. On April 3 it passed the final major hurdle when the right-wing state government chose to enact the law, in a surprise about-face. Before then, it was exercising its legal right to prepare an alternative law and hold a special election within six months where voters could choose between the two. The remaining steps are formalities. The environmental protections are sweeping: 30% of farmland must be organic by 2030; all pastures and meadows are designated as strictly protected natural habitats even when used for grazing and growing fodder; ban on pesticides in nature protection zones; ban on alterations to the 5-meter-wide zone along stream and lake shorelines; ban on new outdoor lighting near nature areas and searchlights everywhere; strict rules on plowing and mowing fields; mandatory curriculum on ecology and agriculture in all schools including farmer education, and more. And then the situation gets strange. Bavaria is the Texas of Germany – conservative, religious, vain, located in the south, and the biggest state (except Alaska is bigger than Texas). Bavarians boast (and here the Texas analogy breaks down), of their state’s wealth, stability, low crime, good education, cleanliness, all-around high functioning, and occasionally good environmental record, all of which they flaunt as contrasts to insolvent, crime-plagued, dirty, party-tourist-infested, only superficially eco-conscious, and above all incompetent Berlin. This reputation is a surprise to Americans but is documented in the German media every day, and polls routinely show that most Germans who don’t live in Berlin share the view and if we’re being honest, so does the objective data (“In love with failure” was the title of a 7,000 word cover story in Germany’s equivalent of the New York Times Magazine, English version here; “a city forever missing the point of itself” says the Times itself; references: 1 2 3 4 5 6 7 8). Crucifixes are required to displayed in all public buildings including schools, courtrooms and hospitals. But Muslim headscarves are banned in courtrooms because they’re “displays of religion”, which the courts have ruled crucifixes aren’t. The overwhelmingly most-popular party is an aggressively anti-environment branch of Merkel’s center-right party that is essentially a shill for BMW, Audi, Siemens, massive industrial agriculture conglomerates and other behemoths headquartered in this richest of German states. Merkel’s agriculture minister from this party lied to her and the German parliament by saying he would cast the deciding vote in favor of banning Monsanto’s notorious cancer-causing Roundup weed killer in a close Europe-wide vote, then went ahead and cast the vote that torpedoed the ban. Neither the minister nor the party suffered consequences. Yet it’s here where support for the sweeping environmental reforms was so strong, the right-wing government gave in. A few individual provisions are in fact already on the books in some other German states while in Berlin such ideas aren’t even on the table. Below is my translation of the referendum – the only English translation that exists, as far as I know. You will notice it keeps mentioning pastures and meadows. This is because less heavily grazed pastures and lightly cultivated meadows (where hay and other fodder are grown) are an important and biodiverse part of nature in Germany and all of Europe, which have almost no forest wilderness like the U.S. does. The last natural acre on the continent was settled and put to practical use centuries ago, leaving the continent with a hybrid human-influenced nature. In all of western Europe, the kind of reasonably natural forests that Americans can see even in an average suburban park, reachable within an hour or two even from innermost New York City, are found only in a handful of small relics. One odd thing about the referendum is that it doesn’t contain the words environment, ecology, ecological or ecosystem. The hardly appear in the associated document that provides detailed explanations of the rationale for each clause. The law does talk a lot about species diversity and species protection. This is problematic and not up to date with current environmental policy and management over the last two to three decades, which now recognize that species are just one part of ecosystems. They’re components, and indicators of ecosystem health, but they’re not the whole thing. Other components include water, soil, nutrients and chemical compounds, and processes such as food webs, pollination, and nutrient cycles. Thus it’s become standard to refer to the environment, or ecosystems, or ecosystem health, rather than just species and diversity, when speaking generally as the referendum does. The point has real-world consequences. We now understand that in the real world, species can’t be preserved as though they’re isolated individuals in a zoo receiving individual attention. You have to preserve their systems and functional networks. One hopes the authorities and courts will recognize this when it comes time to interpret and implement the new law. Existing Bavarian Nature Protection Law requires the long-term safeguarding and development of floral and faunal species diversity and the preservation and enhancement of habitats in order to prevent further loss of biodiversity. The target is to have at least 20% of agricultural land be farmed organically by 2025, under the European Union definition of organic, and 30% by 2030. State-owned lands are already required under existing law to be farmed organically by 2020. Currently 10% of farmland in Bavaria is organic. “State-owned land” probably refers to areas for training and research, analogous to state agricultural extensions in the U.S.. These would comprise a small portion of Bavaria’s farmland and therefore have more educational and symbolic value than any major, measurable impact on the state as a whole. The goals and tasks of nature protection and land management are to be incorporated in education and pedagogy, in [state-mandated] teaching and education plans and instructional materials. The impacts of nitrogen inputs, field sizes, crop rotation, pesticides and other agricultural practices on species richness and soil life are to be communicated. The aim here is a complete transformation of farmer education, beginning with school science education in general, according to statements elsewhere by the authors. Industrial agriculture is the greatest single source of harm to the environment in Germany, more than cars or coal. The initiators wisely focused at every point on supporting and educating farmers and showing how they are just as much victims as everyone else of globalized industrial agriculture corporations and the politicians who work with them to throw ordinary citizens, and future generations, under the bus. Teaching materials – Bavaria has some mandatory statewide teaching materials and curricula but not all German states do. Field sizes – This refers to the problems of large-scale monocultures, which are solved by having smaller diverse fields. Soil life – an odd word choice because in environmental contexts a distinction is made between the living components of the environment (plants and animals) and the equally vital non-living ones, such as the nutrients, minerals, pollution and water. The usual term to encompass all this would be “soil systems” or “soil health”. Private commercial forestry must observe the Bavaria Forest Law and other applicable regulations, whereas state forests have the primary goal of retaining or reaching biological diversity. Bavaria, like more or less all states in Germany as well as the U.S., has state-owned forest lands that are used for commercial timber production. The wording here implies that “observing Bavarian Forest Law” and “retaining biodiversity” are mutually exclusive, which is bizarre, unless the law requires pursing profit at the expense of biodiversity. I can see they want to make biodiversity, rather than profit, the primary goal of state forests, but the wording is confusing. The following clauses protect the ecologically important pastures and meadows discussed above. Mowing fields from the outside inwards pushes animals and insects into a smaller and smaller patch in the middle from which they can’t escape. The alternatives are mowing from one side to the other or inside out, which allows them to take refuge in neighboring unmowed areas. Currently the figure is 5%. Mowing earlier in the year is harmful to food sources for insects and to the biodiversity of plants that need to mature in the time before June 15. The law doesn’t say anything about which areas will comprise the 10%. Allows time for ground-nesting birds to nest before farm machinery flattens the plants and soil. 8. use pesticides and herbicides extensively on long-term pasture, meadow and grassland starting on January 1, 2022. The highest nature protection authority is obligated to report on the status and development of biological diversity in Bavaria, based on selected indicators, in each legislative period (State of Nature report). A status report on organic agriculture lands is to be presented annually to the state assembly and the public. Compensation measures under §15 are to be determined in the context of species diversity and with special regard to supporting old plant varieties. This is referring to actions or payments that the government requires of parties who wish to be granted exceptions from environmental regulations, under certain conditions – for example, when a developer is allowed to build on an environmentally sensitive site in exchange for securing the preservation of a natural site somewhere else. It is saying that these compensation measures will now have to enhance species diversity, especially old (“heirloom”) agricultural and horticulture plant varieties. Most of these – tens of thousands – are extinct except in laboratories, seed banks, a few home gardens and very small, specialized farms. Yet they are critical sources of genetic diversity. They provide tremendously useful genes that plant breeders often need, such as for pest or disease resistance, fruit yield, drought tolerance, and countless other important traits. Interference with insects by artificial outdoor lighting is to be avoided. Searchlights and devices with similar effects are prohibited. The effects on insects must be assessed and the goals of species protection must be considered in the installation of lighting equipment. Lighting in the direct vicinity of protected landscape elements and habitats is only permitted in exceptional cases by the relevant authorities. Lighting at night significantly harms insects and other fauna by disturbing their temporal and spatial orientation and activities. The need to reduce light pollution is great; piecemeal efforts to combat it have been made. Some other states such as Baden-Württemberg already have light-pollution laws. Some other states such as Hamburg and North Rhine-Westphalia already ban this. I’m surprised they didn’t define “natural”. Now what will probably happen is that landowners will rush to plant, or clear, their shoreline areas before the law goes into effect. Then, once it does, the zones will no longer be considered “natural” and will be exempt from the law. Allées are dual lines of trees along a path or road. Bavaria establishes a network of spatially or functionally connected habitats (habitat network) to comprise 10% open land of the total area of the state [sic] by 2023 and 13% by 2027. The original German has an odd, non-standard wording that fails to specify whether the area is to comprise 10% of the total area of the state or 10% of the state’s open, unbuilt area. The official explanation that accompanies the referendum also fails to make the distinction and in fact spells out both possibilities in the same paragraph without clarification: “10% of the state area” and then “10% of the unbuilt area”. The highest nature protection authority is to present a status report on the habitat network annual to the state assembly and the public. Meadow orchard – this term doesn’t really exist in English because it’s not a recognized land use type in the English-speaking world. It refers to pasture, meadow or other open land with scattered fruit trees used for low-density fruit production as a secondary income source. In recent decades it has been recognized in Germany as a landscape type in its own right which contributes to biodiversity. The use of pesticides (plant protection agents) is forbidden in protected natural areas, protected landscape elements and protected habitats, except in commercial agriculture and fisheries areas. The nature protection authorities can permit the use of these agents as long as it does not endanger the nature protection goals of paragraph 1 in the area in question. This is saying that pesticides are banned in nature protection areas, with the exception of commercial agricultural lands that lie within these areas. “Nature protection area” has a different meaning in Germany. It includes not just nature reserves like in the U.S. (of which Europe has very few) but also areas with houses, businesses and farms and towns that have less-stringent protections, and the new law would ban pesticides in these zones. Numbering of articles and clauses has been removed, as has legal jargon and cross-references to other laws, and the section titles are my own.